lovely, bright and a mere $6 for two huge skeins when i purchased them almost two years ago at an op shop in bendigo. i hadn't been able to face winding them into balls and so they sat with the stash, waiting patiently. i'm not sure what the fibre content is but it feels very "expensive", if you know what i mean - smooth and beautiful, i'm guessing a cotton and linen blend. i'm planning a few knitting projects to keep me busy over the next few months of renos until i can get my new craft room together and this yarn finally has found it's calling. i'm thinking a chunky knit pillow with wood buttons, a bit rustic to counter the contemporary colour, and maybe a bit scaled up from a normal throw pillow size... we'll see. deciding this meant i had to start winding. and winding. and winding. i spent the majority of the movie "deer hunter" (shane went to the video shop without me) (that's one long movie, too) winding ONE skein into three 14cm diameter balls (a bit larger than a baseball). by the end of these three balls my hands were cramped into crone's talons and i had to flex them repeatedly to get the blood flowing properly again. and then i discovered it. my right hand index finger wasn't getting any more limber, the pain wasn't dispersing, and it seemed a bit swollen... yes, folks, i actually injured myself winding yarn. i had my finger taped all day yesterday and over night and it's still a bit sore today. i'm officially 106 years old. Beautiful color. Yellow really is everywhere, I even blogged about it myself-daniellebaty.blogspot.com. I always think its amazing what can be accomplished while "watching" a movie. I feel for your injury. I once seriously injured myself cutting out hundreds of velvet stars while an intern. 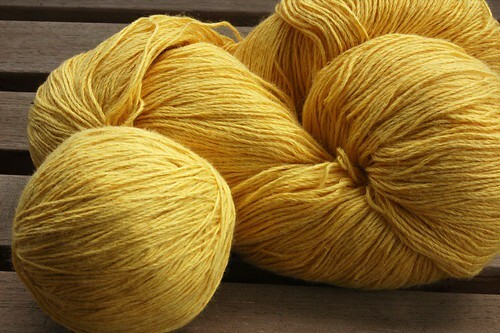 that skein is such a beautiful yellow! oh man, the deer hunter...soooo long, esp. the wedding scene! you could probably knit a whole sweater watching that movie :D.
check my blog in a day or two, when i will feature you, i've been so busy lately, my Etsy shop is finally picking up and i just got 2 international sales this past weekend! My shop is still understocked. Yikes. Who knew crafting could be so dangerous?! Take care of your finger and please send photos of your new house when you get a chance. not to worry, sis, i'm heading your many requests and will have house pics on http://lesterbee.blogspot.com tomorrow. I've noticed yellow everywhere too! I love this shade of yellow. Yarn winding injury, now that's commitment! I injure my hand blogging on a regular basis, and sometimes patting the cat - crazy. there is so much yellow out there..even a swap happening! those skeins look lush! hey- don't feel bad. my doctor put me on arthritis medication...and a thyroid pill. oh but that yellow pillow sounds wonderful. My grandparents used to have this huge pillow that we would all take turns hanging out on when we were little and stayed the night over there- the pillow was named Pizzazz. Beautiful yarn! Deer Hunter is an awesome movie.